Sekayi’s bare brown chest moved up and down, very gently, sweat glistening in the moonlight. One arm lay across his stomach, and blood pooled into the depression of his belly button. Tareq had helped them turn him over, poor Tareq with his face a blurry mask of tears; Tareq had nevertheless kept quiet and pulled up his arm as Mhumhi and Kutta tried to gently turn him without tearing him further. He had two bite wounds- a jagged one on the flesh of his arm, and one on the side of his neck. Mhumhi surmised that Hlolwa had grabbed him by the arm to pull him down before striking a more fatal area. But Sekayi must have had time to turn his head and perhaps his upper body away. She had not hit the thickest vein in his neck. But she had removed his ear, which Mhumhi had accidentally stepped on while they were moving the body. Sekayi’s eyes were open, wide and black, though if Mhumhi stood at the right angle he realized they shone yellow, reflecting moonlight. His pupils were dilated, and he had neither spoken nor blinked in all the time that they had been watching over him. Mhumhi doubted that he was actually conscious. “We have to stop the bleeding,” Kutta whispered. Mhumhi was not sure why she was whispering, but he kept his voice low too; it seemed appropriate. Kutta looked at Tareq, who was standing a few feet away, rocking back and forth on his heels. Mhumhi felt a stab of pain. From the concrete house there suddenly came a shrill howl; they all flinched. They had left Mini there, on the floor, after she had fallen off the chair in her urgency. “Take me, take me, take me to him,” she had begged, but they had only gotten Tareq up to help them turn him. Mini howled again, her voice quivering. Mhumhi did not reply. He was looking across Sekayi’s body at Hlolwa, who was still sitting on her haunches- unchained and untethered, but still sitting. She was looking out and away across the moon-dappled dump. Kulwe was also still lying with his shoulders back against the stake. Mhumhi stepped closer to him, automatically angling his body so that he stood between Tareq and Hlolwa. He crouched down, his hands still over his ears, trembling. “Tareq, the bad dog can’t hurt you, he’s gone, he’s dead,” said Kutta, pushing close to him, licking the tears and snot on his face. Mini added another howl to his whimpering, and Hlolwa turned her head slightly towards them. Mhumhi heard Kutta snarl and looked to the left, but she had already sprung forward. She hit Hlolwa’s shoulder with enough force that the two of them spun around together, and then forcibly rolled the heavier dog on her back between her forelegs. Kulwe cried out shrilly, struggling in the dirt, retching and spitting up fluid. Mhumhi took a few steps forward, hesitated. Hlolwa stayed still on her back, looking away from Kutta. She licked her lips as Kutta growled and brought her bared teeth closer. Mhumhi licked his lips, too. Kulwe whined and shook, his ears back and his eyes wide like a frightened puppy. Hlolwa turned her head against the ground to look at him around Kutta’s leg. “Mhumhi,” said Kutta, looking at him again, impatience coloring her voice. “There’s no decision,” she snapped, but her raised tail was quivering, and her throat was moving as she swallowed. Hlolwa pulled her own tail in so that it tucked between her legs and turned her head, exposing her throat. Kutta’s jaws parted and closed soundlessly. Again she looked at Mhumhi. She looked at Sekayi, breathing slow, bleeding silently. “Right, then, later…” She scrambled backwards off of Hlolwa, and the painted dog rolled onto her side. Her eyes flicked sardonically towards Mhumhi. He chose to ignore the look for the moment. It did not seem as though she meant to run away. He and Kutta went back to Sekayi, nosing him. 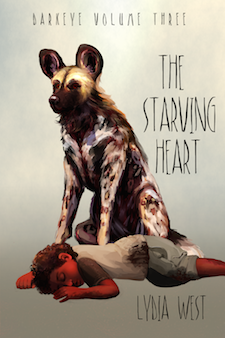 Mhumhi gently licked the raw patch where his ear had been, his mouth filling with blood. Kutta was looking over his arm. Mhumhi joined her, looking at the long open weal Hlolwa had opened up on the bouda’s arm. He had not noticed before, but the fine hairs on Sekayi’s arms were coarse and gray. “Who’s going to bandage it?” said Kutta, a little hopelessly. Mhumhi looked back at Tareq, who was squatting with his arms around himself, rocking back and forth. “We should ask Mini,” said Kutta. “She knows about caring for hulkers. She helped us that time when Maha-” She broke off, glanced at the other painted dogs. “I don’t think we should bring her out here to see this,” said Mhumhi, as another of Mini’s howls split the silence. Mhumhi looked around too, but there was no sign of the screamer. He had a sour notion as to why, looking at their two captives. “You be quiet,” said Mhumhi, though his tone was uncertain. He gave her a wary glance and moved to put his mouth over Sekayi’s wound. Kutta was ranging further and further away, her calls becoming increasingly desperate. Mhumhi’s mouth was filling with warm blood again, dripping under his chin and off his fur as he tried to gently squeeze the sides of Sekayi’s wound together. His nostrils flared and twitched at the scent of it, and he tried not to swallow. The position felt dangerous, his jaw muscles longing to close harder and cleave. Sekayi’s pulse beat softly against his tongue. He could taste exposed hot muscle, gooey fat. Mhumhi squeezed his eyes shut; the blood kept coming. He jerked back and looked up- Kutta was tugging Dot forward by the hand. Her head was lowered, her pace shambling, and she was uttering soft sounds of distress. Dot pulled her hand out of Kutta’s mouth and grasped it at the other, staring at the ground. Mhumhi was not sure she had even noticed Sekayi; the presence of Kulwe and Hlolwa seemed to be all that was occupying her mind. “We need cloth,” he told Kutta, and she gave a grunt of agreement and attacked Sekayi’s pants. Mhumhi was impressed with the neatness of the strips she tore, and also by Sekayi’s exposed, muscular thighs, but he also felt more than a little futile. They had the bandages, they had the hands that could bind them, but how were they supposed to tell Dot what to do? Kutta took the first strip and pressed the end against Dot’s clasped hands. Dot took it, seeming rather surprised, and then dropped it. “No, Dot,” said Kutta, swooping down to pick it up again. Dot obediently took it from her mouth, looked at it for a moment, and then let it go. Behind him, Mhumhi thought he heard Hlolwa give a soft snort. Mhumhi and Kutta fell back on either side, both quite surprised, as Tareq led Dot over to Sekayi’s body. He squatted to pick up one of the other strips of cloth that Kutta had made. He picked up Sekayi’s limp arm with a shaking hand and wrapped the end of the bandage around it. The end became damp with blood at once, and the loose binding slipped. Dot’s gaze quite suddenly became more focused, and she gave a sort of twitch. She took the end of the bandage from Tareq and wound it around more securely, wrapping up Sekayi’s wounds in a swift, practiced manner. When she reached the end of the bandage she reached for another one, and Kutta passed to her, looking a bit dazed. “She’s done this before,” Mhumhi observed. Dot had a smile on her face now, her expression eager and childish. Tareq crawled away from her and put his arm around Mhumhi’s leg. Tareq said nothing, just huddled against Mhumhi. Mhumhi let his muzzle rest on the top of his head for a moment. Dot hooted, turning back towards them. Sekayi’s arm now bore a tight, neat bandage of fraying cloth. Mhumhi could see the dark outline of the wound underneath as the blood spread through. “Good girl, Dot,” said Kutta, giving her tail a wave. “What about the wound on his neck?” asked Mhumhi. “Is Sekayi gonna wake up?” Tareq whispered, his grip tightening on Mhumhi’s leg. He couldn’t bring himself to say more; that the problem would not be whether or not Sekayi woke up, but rather how much blood he had lost and would lose, and how infected his wounds would become in the ensuing weeks. Mini’s howls had not ceased, and he wrinkled his lips as her voice rose anew. He was looking fearfully at Hlolwa over Sekayi’s body. She slowly turned her head to look at him, and he shrank further back. Mhumhi rumbled softly. “Spare me,” she said, and looked away again. Tareq frowned in a near-tears way and stiffened around Mhumhi. “You’re a bad dog,” he said, looking at Hlolwa. She looked at him more quickly than before, the motion sharp, and Mhumhi’s eyes widened, his heart pounding. Dot made a shrill noise and backed up a few steps. “Shut up, you little devil,” said Hlolwa. She stepped over Sekayi’s body. Mhumhi drew back his lips and ears as she approached, growling with more fervor. Kutta joined him, her eyes flashing and her fur rising. Hlolwa stopped and looked coldly down her muzzle at Tareq, who was crying in earnest now, but still managing to scowl at the same time. “I hate you,” he blubbered. Hlolwa gazed at him, her eyes hooded. Mhumhi put his ears back up in his confusion, and Hlolwa gave a whuffing laugh that managed to reek of sarcasm. “What do you mean by that?” demanded Kutta. “You don’t expect us to kill you for this?” added Kutta. Mhumhi wanted to draw back from that- the statement, and the look, but Tareq was anchoring him with his grip. “He’s not the only one who has a say,” said Kutta, with a rumble. Hlolwa broke her gaze away from him at once, her ears turning slightly back. “What makes you think that?” exclaimed Kutta, very loudly. Mhumhi winced. Denial would have looked stupid at that point, so Mhumhi held his tongue. Kutta looked murderous. “Madame, no,” said Kulwe, in a pained way. She stopped. Her flanks contracted for a moment. Mhumhi stole a look at Kutta, and found that she had folded back her ears. Kutta gave an incredulous whuff. “Under the right circumstances-” started Hlolwa, but Kutta butted in. A line of tension appeared between Hlolwa’s shoulder blades, and she sucked in her flanks again. “I’ll hit you!” cried Tareq, scuffing a foot sideways in her direction. Hlolwa paused and looked down at him again, and he retreated back into Mhumhi’s side. “One swift bite,” she said. Mhumhi looked back at Kutta, who scuffed a paw along the ground. “We’ll consider it,” he said. Not a chance. She walked away, and Mhumhi went tense, then remembered she had nowhere to go. It still felt wrong to let her have free range, though. What mischief could she get into…? He watched her warily as she went over to the stake where she had formerly been chained and lapped up some water from a shallow dish Sekayi had left out. Then she lay beside Kulwe and curled up. Their audience seemed to be over, though Mhumhi still felt that jellylike sensation of unease. Kutta seemed unhappy as well, and stalked over to sit beside Sekayi’s legs. “All right,” he said, before he realized she had left him Mini to deal with. He huffed through his nose. He went to take Dot’s hand. The screamer, who had backed away into the fire pit when Hlolwa had walked closer, hooted in a sooty way. Mhumhi exchanged a solemn wag with Kutta. Hlolwa appeared to have gone to sleep, though he suspected she was only closing her eyes. Still, he felt that she was at least being honest about how little danger she presented them at the moment. He stepped forward, stopped, and looked back at Sekayi. At some point his eyes had closed. Mhumhi looked at his face, marked with innumerable lines and wrinkles, and then upwards. The moon was bright and full. I thought in the last chapter they figured she was very early in the pregnancy and would be 2 more months?